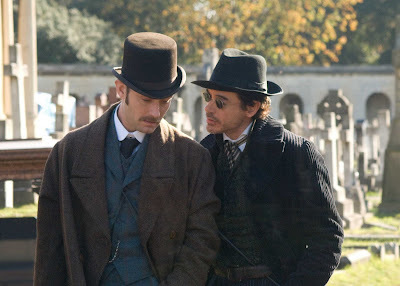 The hats in the new Sherlock Holmes movie were, overall, fantastic. Whoever made them did a great job of distressing the men's hats to look like they'd actually been worn. My husband, who is even more of a men's hat fanatic than I am, thought that some of them looked more like costume hats (bad material, not finished correctly, etc.) than real, but I didn't notice at the time, I'm going to see it again to see if I can spot the ones he's talking about. 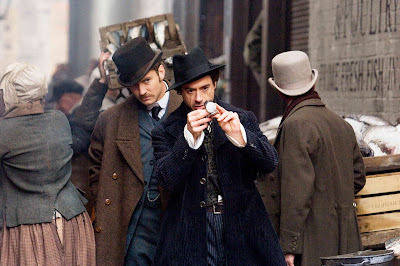 Of course, for period pictures where they have to have lots of hats for extras etc. 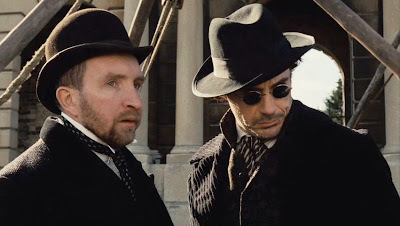 they'll usually have the people in the background wearing cheaper costume hats, but if done well you shouldn't notice when watching the film. Apparently they got all of the hats for Holmes at Christy's. 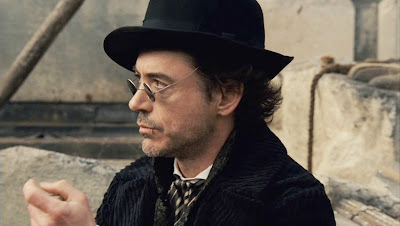 The fedora with a wide brim and edging that Holmes wears in the second half is probably not quite right for the time period (it struck me as more of an Edwardian or 20s style, rather than Victorian- it's too soft and the brim is too wide for earlier street wear), but I swooned over it and have been obsessed with it since. I was totally inspired and have been busily playing with edging on my own hats, and some new shapes, more on what comes out of my musings in future postings. 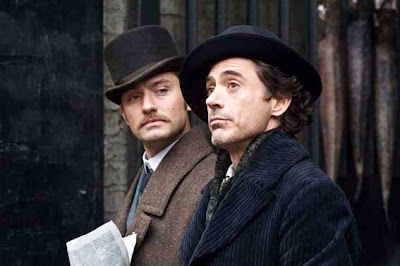 On the other hand, Irene Adler's hats were hit and miss. 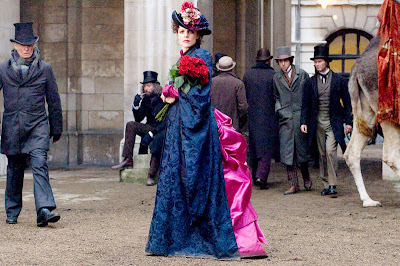 I found the tall hat with one side flipped up, covered in a mass of silk flowers, nauseating. But that's just me, I can't stand overdecorated, overly feminine styles, she looked like a parade float in it. Even for the period, the amount of flowers seemed excessive, with little thought to composition, it was just lumpy. 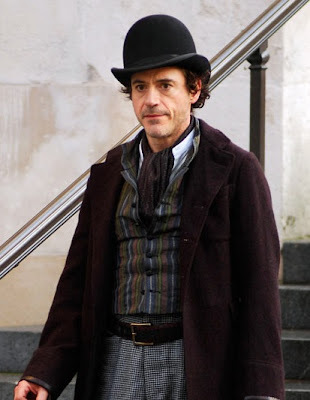 The shape of the hat underneath is pretty standard for the 1880s and was great but it just had too much junk on it. The next hat she wore was a FANTASTIC bowler, though, which made me feel better. Couldn't find a photo of it, though, sorry, you'll just have to watch the movie to see it. I'll have to agree with others who have commented on the movie, they did seem to mix decades rather freely, but really, it's an action movie, a romp, so I wasn't feeling super critical during. It was fun to watch, and it gave me some good material to chew on.